A book written in haiku form! 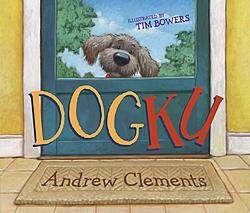 Dogku tells the story of an abandoned dog and the family he enounters. Each page is written as a haiku, but weaves together to tell a story. Will the family keep the dog? An ingenious way to organize a story, each page is a separate hiaku that pushes the story forward until we find out if the family keeps the dog or not. Lesson Idea: Read this aloud to students and discuss the idea of haiku as an organizational writing tool for story telling. Have students practice writing haikus and then ask them to write a story in haiku form.